SEATTLE, WA--(Marketwired - Aug 22, 2017) - CFN Media Group, the leading creative agency and digital media network dedicated to legal cannabis, announces the publication of an article covering Medical Marijuana Inc.'s (OTC PINK: MJNA) opportunity in Mexico now that the State of Mexico is buying the company's HempMeds® RSHO-X cannabidiol (CBD) oil for its citizens. Mexico's War on Drugs has taken a tremendous toll on the country. Since the program began in late-2006, the death toll has exceeded 111,000, human rights violations have become a major concern, and drug use has dramatically increased along border states. Many drug cartels have also become involved with human trafficking, which represents a humanitarian crisis of its own spurred on by a largely unsuccessful war on drugs. With several U.S. states legalizing marijuana, Mexico has started to take a different approach under President Enrique Pena Nieto. The country has even become a pioneer of medical cannabis by first permitting the importation of cannabidiol ("CBD") oils and later legalizing medical cannabis on a broader level. Newly proposed measures would enable citizens to possess up to an ounce of cannabis without any repercussions. "So far, the solutions [to control drugs and crime] implemented by the international community have been frankly insufficient," said Pena Nieto to the 2016 United Nations General Assembly Special Sessions in April 2016. "We must move beyond prohibition to effective prevention." The presidential decree effectively eliminates the criminalization of the medicinal use of cannabis THC, CBD, and all cannabis derivatives, while legalizing the production and distribution of cannabis for medicinal and therapeutic purposes. Moving forward, the Ministry of Health will be required to study the medical and therapeutic effects of the drug before creating a framework for a medical marijuana program. There are few cannabis companies operating in Mexico and one clear leader in the space -- Medical Marijuana Inc. In February 2016, the company became the first company to receive government import permits for cannabis products via approval by the Mexican Health Department, COFEPRIS. These permits were granted for individuals suffering from rare forms of epilepsy that may be effectively treated with cannabidiol ("CBD") oils. The HempMeds Mexico products contain no psychoactive tetrahydrocannbinol ("THC") and are 99% pure filtered CBD oil. The company recently began clinical studies of its HempMeds RSHO-X products under the guidance of Dr. Saul Garza Morales, a leading pediatric researcher and neurologist in Mexico. The studies in children with severe epilepsy found that 86% of the 29 patients experienced statistically significant (> 50%) reductions in motor seizures. A further 17% of the patients were fully seizure-free for a 4-month period following the clinical studies. This week, the State of Mexico's government announced that it would directly purchase CBD hemp oil products from HempMeds Mexico to treat 11 of its citizens suffering from varying indications, including Refractory Epilepsy and Lennox Gastaut-Syndrome. The move marks the first time that the government has purchased CBD products for its citizens, and successful results could translate to additional purchases down the road. 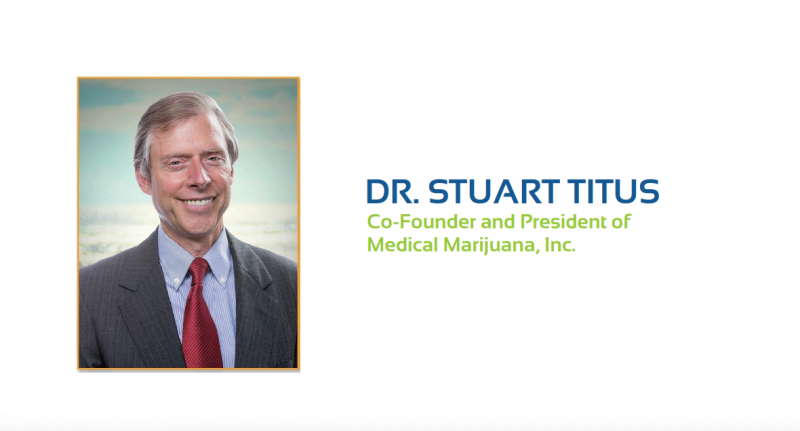 "The plethora of benefits of medical cannabis to treat several types of indications is undeniable and we are encouraged to see not only health professionals, but also now governments, are becoming increasingly interested in how CBD hemp oil can help heal,"
said Medical Marijuana Inc. CEO Dr. Stuart Titus in a recent press release.